Season 1 of Game of Thrones is over and I’m already going through withdrawal. From the fierce opening with the Night’s Watchmen facing the White Walkers to the closing moments of dragon birth, this season has been ten episodes of television magic. The season finale proved to be nothing short of awe inspiring, but before we get into that I have a few thoughts on something that has been bothering me for the last week. Now, I know a lot of fans are whining that Drogo and Ned Stark are dead. They’ll complain that you can’t kill off main characters! You can’t get rid of actors that are the main draw for fans! Rubbish, I say. Although I haven’t read the book series, I understand that the producers of the show are following the basic framework and I applaud this. If you go off that path you radically alter what happens down the line and then you can’t really call it Game of Thrones. It bothers me that so many people don’t understand (or respect) creative vision. They think that shows should conform to their tastes and expectations. Not so, folks. Don’t you want to be surprised by plot twists? Don’t you want to be amazed by clever dialogue and character moments that you would never think of? I know you want to be comforted by consistency in what you watch, but if that’s the case, go watch American Idol or something with a set formula. Game of Thrones is just not that kind of show. With that said, I’ll go on record by saying that this episode‘s final moments left my jaw on the floor somewhere behind the couch. I haven’t been this excited and saddened by a finale since Charlie Pace bit the big one. It was just that good. I could on and on with a detailed recap, but those of you who care have already seen this episode. So I’ll leave you with a few questions and observations. – And what of those dragons? 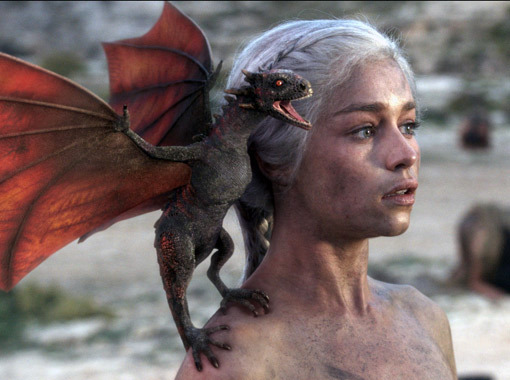 Danaeris Stormborn of the House Targaryen now has powerful creatures that haven’t been seen alive in over 300 years. As powerful and ruthless as Khal Drogo and his Dothraki warriors were, I doubt they could hold a candle to the might of three fully grown dragons. Does Dany use them to go to war with the citizenry of Westeros? – Speaking of Westeros, it seems that if Dany does make her move, it’ll be relatively easy to best her enemies. As the Starks war with the Lannisters and young Joffrey Baratheon puts the hurt on anyone who even looks unfaithful, Robb Stark is hailed as King of the North. What does this mean for House Stark? Do they rescue Arya and Sansa and head back to their new kingdom? Or does Robb press the issue and make a play for Kings Landing and the Iron Throne? – The Sisters Stark find themselves in quite interesting circumstances. Sansa is set to marry the man boy who murdered her father. Arya is off to Castle Black under the protection of the Night’s Watch. Does Sansa go through with possibly the worst marriage ever or does she finally assert herself by standing up for her family? And will we see the first Sister of the Night’s Watch in young Arya? – Tyrion is set to be the Hand of the King? Has the Imp found legitimacy in the eyes of his father? Time will tell. I’m just glad that the Starks have Jaime in custody. Seeing Catelyn bash his face with a rock had me smiling ear to ear. Take that, pretty man! – I don’t see a happy future for the men of the Night’s Watch beyond the wall. Maybe Lord Commander Mormont has bitten of f a bit more than he can chew. It’s been said on numerous occasions that the Watch is somewhat of a joke. It doesn’t resemble the elite defense force it originally began as. Will this ragtag band of criminals, misfits and noblemen be able to best the White Walkers in battle? My heart says yes and every other part of me says no. Good luck boys. Well, that’s all for me. I hope you all enjoyed Season 1 because I know I did. Unfortunately, waiting till Spring 2012 is going to be painful. I’ve chosen to get my fix by reading the books. I’ve already caught up and am reading season two (A Clash of Kings). 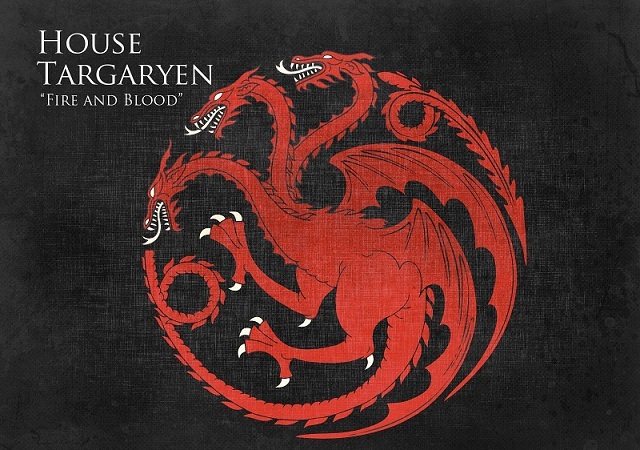 Having said that I don’t think Targaryen story makes much sense. Why would Dana want the Iron throne? She has more in common with the Dothraki then the machiavellian court of King’s Landing, and if the Dothraki really respect power, then with three full grown dragons, Dana’s hoard would eventually dwarf Kal Dargo’s. So other than to feed Lannisters, Baratheons and Starks to her dragons, I don’t see a really good reason for her to cross the narrow sea, do you? Well, considering that I haven’t read any of the books, I’m at a disadvantage in this discussion. 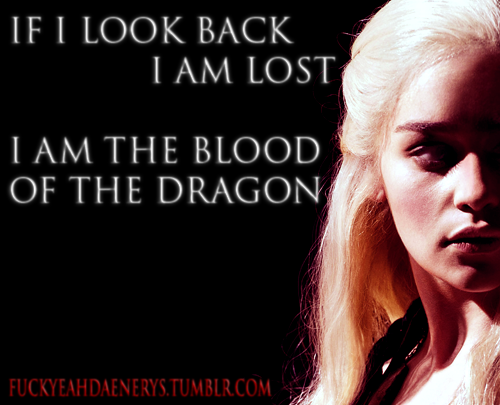 What I can say is that I think the Targaryen storyline made a great deal of sense. Viserys wanted nothing more than to retake the Iron Throne. He truly believed that it was his. For it, he was willing to sell out his own sister. She happens to fall in love with Drogo and essentially becomes a bridge between Targaryen expectations and Dothraki customs. She’s the Khalisi and the name she chooses for her firstborn is very symbolic. Rhaego, for her slain brother Rhaegar, as well as a nod to her beloved Drogo. Before his death Khal Drogo decided to make the great leap to conquer Westeros. He was going to make a place that would allow his child to become the Stallion Who Mounts the World. When he died, I feel like Dany’s motivations became conquering the Iron Throne as a symbol of her quest for vengeance. Robert’s Rebellion led to all of this. Her brother(s) are dead. Her love is dead. Her child is dead. The Khalasar does not respect a Khalsi without her Khal. And because of all of this, I feel that she will do whatever she deems fit to honor the memory of her lost loved ones. It’s a path forged in fire and solidified in blood. I don’t think that her motivations are binary. That is to say exclusively one thing or the other. It’s the sum of her experiences. Then again, I have no knowledge beyond the show, so I could be way off the mark. Regardless, thanks for reading and, more importantly, commenting.